In the Android-powered smartphone universe LG, plays second fiddle to its Korean neighbour Samsung. The tech company is looking to close the sales gap via its new selection of top-tier models like the G2 and midrange devices such as the R2 700 Optimus L7 II. The highly pocketable (121.5 x 66.6 x 9.7 mm; 118 g) Optimus L7 II competes within a very competitive market segment, populated by devices the likes of the Nokia Lumia 520 (review) plus a crop of Android competitors. As with the Optimus G E975 (review), the all-plastic construction is solid. We do however feel that the device could do with a bit of a design makeover, since the unit would be unrecognisable in a smartphone line-up if not for the LG logo on top. Strangely, the L7 II makes use of a conventional SIM as opposed to the more common microSIM. Users have access to a volume rocker on the left side of the device, plus a QuickButton just above the combined volume keys. By default this button launches LG’s QuickMemo app that enables users to write notes on the display by using their finger, which can then be saved or shared across social networks, in an SMS or e-mail. You can also change this button to launch another app such as the camera or even WhatsApp. The lock/power button can be found on the right side of the L7 II, and like all the other buttons it is easy to reach. These buttons can also be quickly located at night, simply by feel thanks to its grippy texture that stands from the phone’s glossy, smooth plastic styling. We found the multicolour notification light surrounding the home button to be a nice design touch. It lights up in different colours to indicate notification, emails or messages received (white), as well as the status of the battery (green for fully charged, red for low power). 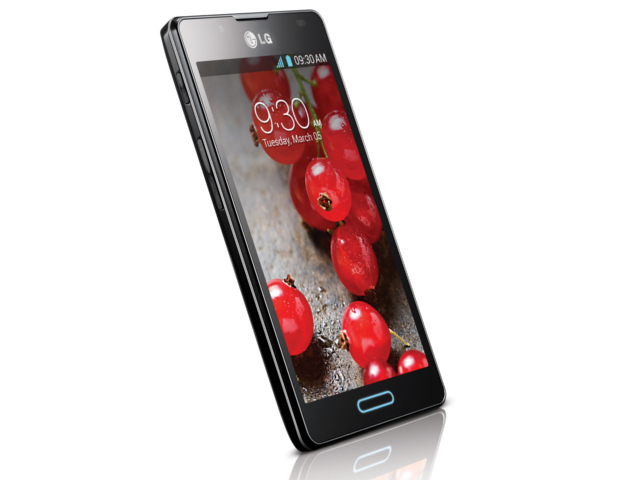 LG equipped the Optimus L7 II with a 4.3" (480 x 800 pixels; 217 ppi pixel density) IPS LCD capacitive touchscreen. This may be a far cry from the full HD screens you get on top-end smartphones like the Samsung Galaxy S4 (review), but still impressed us with its excellent viewing angles and good colour saturation. This display can be counted amongst our favourite midrange smartphone touchscreens. The screen does however get dirty quite easily, being a magnet for fingerprints and oily skin residue. Unlike the 4.3" ClearBlack capacitive touchscreen of the Nokia Lumia 720 (review), it is highly reflective when used in direct sunlight and not very conducive to a pleasant outdoors viewing experience. The Optimus L7 II boasts an excellent display for this pricepoint as well as a novelly placed (surrounds the home button) notification light. Powering the Optimus L7 II is a Qualcomm Snapdragon MSM8225 chipset that packs a dual-core Cortex-A5 CPU clocked at 1 GHz per core that is coupled with just 768 MB of RAM. This combination managed to best most of the L7 II’s midrange rivals including the Samsung Galaxy S3 mini (review), Sony Xperia sola (review), and HTC Desire X (review) within Smartbench 2012 and AnTuTu. As can be expected, the L7 II also easily eclipsed the original Optimus L7 (review) during benchmarking, with the old L7 packing a single-core 1 GHz Cortex-A5 processor. Benchmarking scores is not really the best reflection of real world, everyday usage performance though. We found that the Optimus L7 II delivered smooth and snappy performance whilst navigating the OS and running apps or playing games. There is some very noticeable lag though when multitasking. Android 4.1.2 (Jelly Bean) runs the mobile OS show along with LG’s Optimus UI 3.0 skin. Like its Korean neighbour, Samsung, LG prefers to utilise a heavily customised skin that packs plenty of added functionality. Admittedly, there are less added functions than you would find on the LG Optimus G, but users do get to use QSlide, which is a video multitasking feature. It enables users to watch a movie whilst continuing to perform another task such as browsing the web or chatting via Facebook Messenger. QSlide provides a slider that enables you to adjust a video’s transparency on the fly. This might not be the most practical of features but makes for a visually stimulating one. Another handy feature is Smart Screen which employs the front-facing snapper of the Optimus L7 II to track your eyes, and check whether you are still looking at the display and then prevents the screen from turning off. It works as well as Samsung’s Smart Stay seen on devices like the Galaxy Note 2 (review). At the back of the smartphone you will find a 8 MP rear-facing camera, whilst the front boasts a VGA snapper. Users are able to capture panorama landscape shots, as well as quick burst photos (Continuous shot). Photo quality is surprisingly good during the day when there is decent amount of natural light available. At night though, you do get a high degree of noise introduced in your pictures, but the bright LED flash does an admirable job of lighting up your photo subjects at close range. A unique LG camera feature is the ability to capture photos by using only your voice, simply by saying any one of four preset phrases including “cheese”, “whiskey” or “LG”. This Cheese shutter functionality does work well, but you need to factor in the slight delay before the photo is ultimately captured. Also onboard is a 2460 mAh Li-Ion battery that will get you through a working day, Bluetooth v3.0 with A2DP, and Wi-Fi 802.11 n.
Users only get 4 GB worth of internal storage, which is definitely not enough for all one’s apps, photos, music, and videos. Luckily, this storage can be expanded by up to 32 GB via a microSD memory card slot. We also like the fact that the memory card slot is hotswoppable, meaning you can insert or remove it without having to turn off the device first. LG’s Optimus L7 II is a decently specced midrange smartphone offering that boast a snappy CPU, Android Jelly Bean and excellent 8 MP snapper. It goes for a recommended retail price of just R2 600, making it less expensive than the Optimus L7 it replaces (R3 700), as well as the Desire X (R4 000), Xperia sola (R4 300), and Galaxy S3 mini (R3 500). It might not have the most recognisable branding, eye-catching design, or a great deal of internal storage, but the Optimus L7 II does sport all the functionality and midrange specs that a user needs at a very decent price-point. Excellent display for the pricepoint. Jelly Bean runs the OS show. Handy OS features included with lightweight Android skin. Good camera performance in adequate lighting conditions. Nondescript design does not scream LG Optimus smartphone. Low RAM amount for memory hogging Android platform. Excellent display for the pricepoint; Jelly Bean runs the OS show; handy OS features included with lightweight Android skin; good camera performance in adequate lighting conditions; compact device; useful quick launch button; affordable midrange smartphone; expandable storage via microSD; and funky notification light. Noticeable lag when multitasking; nondescript design does not scream LG Optimus smartphone; and low RAM amount for memory hogging Android platform.